Diseases that occur underground can be difficult to detect and diagnose but they must be identified correctly to enable appropriate control measures to be implemented. Root diseases that are most likely to be encountered under intensive cereal cropping systems are rhizoctonia bare patch, root lesion nematode, take-all, fusarium crown rot, cereal cyst nematode, common root rot and pythium root rot. Links to information on disease symptoms and management strategies are provided here and diagnosis tools and services are described. Bulletin 4732 of the same title is available on request. Diseases caused by pathogenic micro-organisms can significantly reduce the yield of cereals. Some of these diseases are uncommon, while others occur over a large area of the Western Australian wheatbelt every year. The most prevalent root diseases of cereals in WA are rhizoctonia bare patch, root lesion nematode, fusarium crown rot and take-all. Less widespread are cereal cyst nematode, common root rot and pythium root rot. It is crucial that these diseases are correctly diagnosed to enable the right control measures to be employed for the benefit of crop yields. For further information refer to Root lesion and burrowing nematodes: diagnosis and management. 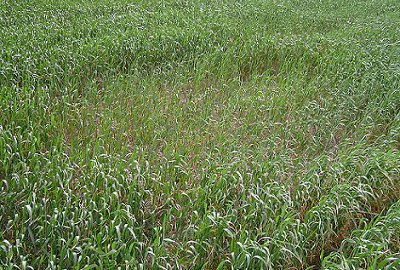 To determine whether a fungal or nematode root disease is affecting a cereal crop, look for patchy areas of poor crop development associated with localised disease build up. Some root disease such as fusarium crown rot may be more evenly scattered or distributed throughout the crop. Next, carefully dig up samples of apparently diseased as well as healthy plants. Thoroughly wash the soil from the roots and examine them for indicative symptoms which vary to some extent depending on the disease. Unthrifty plants may have smaller root mass, fewer root branches, root browning, root clumping or damaged root tips (spear tips) compared to thrifty or well grown plants near by. The MyCrop app may assist you with diagnosis. Suspected root disease or nematode problems in-crop can be confirmed by laboratory analysis of soil and/or roots. For patch diseases, sample from the edge of the patch rather than the centre. Do not send washed plants to the laboratory. Follow sampling guidelines from DDLS - Plant pathology services. Growing season tests are carried out on affected plants and associated soil. Although little can be done during the growing season to correct a fungal or nematode root disease, it is important to identify the cause of the problem so that decisions on appropriate management strategies can be taken leading up to and during the following seasons. Test kits are available from DDLS - Plant pathology services and participating distributors. To obtain submission forms and full sampling instructions, contact your local department office. Pre-season assessment; the risk of root diseases being present in a paddock at a yield limiting level next season can be determined by paddock history, paddock monitoring in spring or soil tests. A review of paddock history will identify the diseases likely to be present in each paddock. The level of disease likely to develop can be determined by digging up plants in spring from areas of poor growth and examining the roots for symptoms. An informed decision can be made about the future use of each paddock based on the presence or absence of a disease and the conduciveness of the current season and crop to further develop that disease. Pre-season soil tests can be used where the paddock history is not adequate for planning future use. Soil tests are conducted on representative soil samples. PreDicta-B™ uses DNA assessment to determine the root diseases or nematode species present and the likely risk of crop damage. Test kits are available through accredited agronomists and resellers.